I feel obliged to issue a public health warning before I go any further with this post. This dessert is not for the faint-hearted and certainly not for anyone on a calorie-controlled diet. It’s extremely rich and something of a colossal beast, easily serving 12 to 14 people, so only make this if you’ve got the man, woman and child-power to tackle it, and be sure not to feed them too much beforehand. The reasons for making this were three-fold. 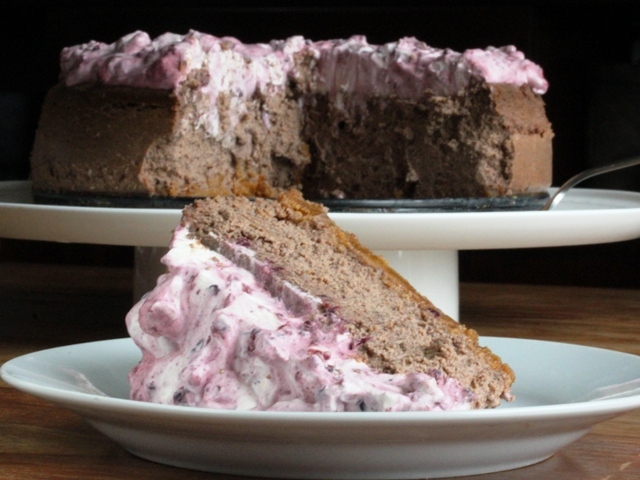 Firstly I was inspired by the stunning showstopper cheesecakes in episode four of the Great British Bake Off, although I was most definitely not brave enough to attempt a tiered version. Secondly I’ve been mulling on recipe ideas combining blackberries with chocolate in order to take part in Tin and Thyme’s We Should Cocoa challenge, this month guest-hosted by The Veg Space. And thirdly? Well, it’s been ages since I last made a baked cheesecake, so I thought it was about time I tried my hand at another one. 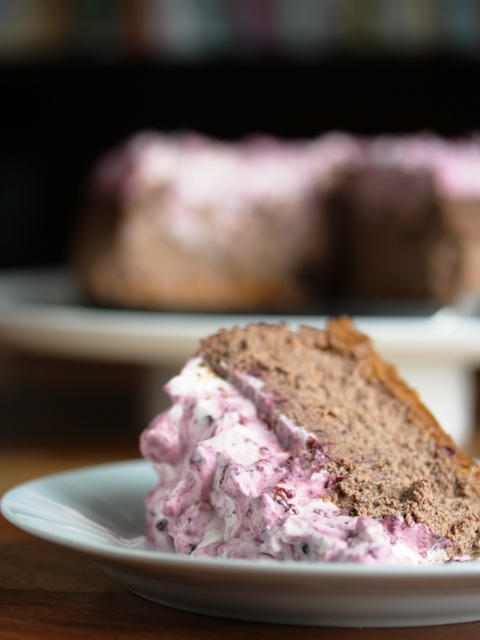 The biscuit base is made from ginger snaps which contrast well with the soft, creamy, chocolate cheese, and it’s topped off with an abundance of whipped cream melded with sweet, syrupy blackberries, picked from our local hedgerows. We’ve been eating it all weekend and still have half in the fridge. I keep finding myself ‘tidying it up’ whenever I go to get milk out for a cuppa. Despite its richness, it’s really rather moreish. I’m quite glad I’m on a 5:2 fast day tomorrow, as I think I might have overdone it slightly the last couple of days. Preheat oven to 160°C/gas mark 3. You’ll need a 23cm springclip tin, which should be greased, and a baking sheet. Start by making the base. In a bowl, mix the melted butter into the crushed ginger snaps. (I do the crushing in a tied food bag and bash away with a rolling pin.) Then tip this into the prepared tin and use your fingers to firmly press it down to form an even layer. Place the tin on the baking sheet and bake in the oven for 10 minutes. Leave to cool. Place the chocolate in a glass bowl with a couple of tablespoons of water and gently melt in the microwave. Leave to cool to room temperature. Put the cream cheese into a food processor and whiz until just smooth. Pour in the sugar, eggs and vanilla extract and process again until combined, but don’t over process. You don’t want to get too much air into the mixture at this stage as this can lead to the cheesecake cracking. Add the melted chocolate and mix again until just combined. Keep the tin on the baking sheet and pour the chocolate cheese mixture onto the base and gently smooth the top with a palette knife or spatula. Place in the oven and bake for around an hour, or up to an hour and a quarter. The cheesecake is ready when it’s just set but got a good wobble. Switch off the oven and leave the cheesecake in there for another hour to cool. If like me you have an Aga, then bake in the roasting oven on the shelf on the floor with the cold plain shelf on the second set of runners. Bake for 20 minutes and then transfer the cold plain shelf to the middle of the simmering oven and place the cheesecake on this. Bake for another 45 minutes to an hour. As ever, thanks to Mary Berry and her New Aga Cookbook for the Aga advice. Remove from the oven and allow to cool completely before running a knife around the inside of the tin to loosen the cheesecake. To make the topping, put the blackberries in a pan with the sugar and a tablespoon of water and place over a medium heat. Cook for around 10 minutes until the blackberries are soft and just beginning to fall apart and the sugar has formed a thick syrup. Using a wooden spoon, crush the blackberries slightly. Remove from the heat and leave to cool. Whip up the cream until just stiff and fold in the blackberries along with the syrup. Don’t be too thorough. I like the topping to be almost two-tone. Slaver the cream on top of the cheesecake and chill the whole thing in the fridge for a few hours or overnight. To serve, unclip the tin and remove the cheesecake to a serving plate or stand. Stand back and adore lovingly for a moment or two before diving in. 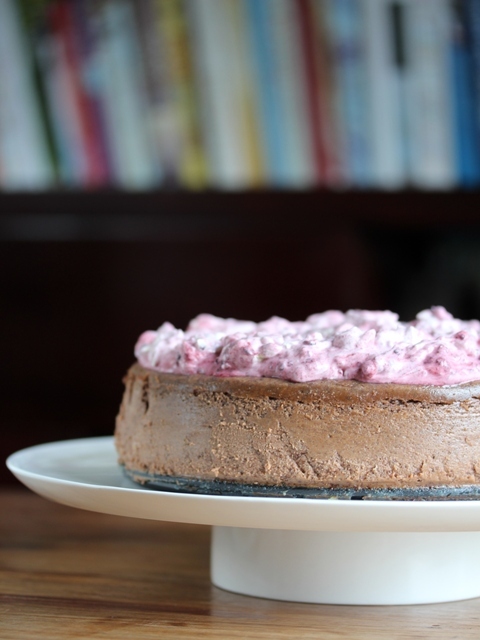 I am entering my Chocolate Cheesecake with Blackberry Cream into September’s We Should Cocoa challenge, established by Choclette at Tin and Thyme and this month hosted by Kate at The Veg Space. This looks incredible! What a treat – and love the disclaimer for those on calorie controlled diets!! 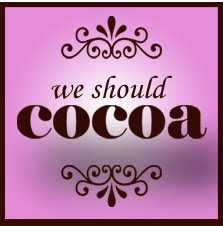 Thanks for linking up with #WeShouldCocoa, a fabulous entry! Thanks so much for stopping by Simona and your lovely comments – and thanks to Karen at Lavender & Lovage for the introduction! I’ve just been over to your blog too. Your plum jelly looks wonderful!